Added by admin on August 8, 2018. 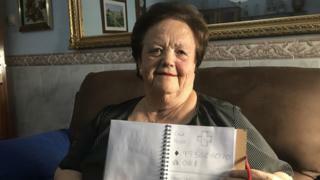 A Spanish man has revealed how over the past 20 years he has helped his illiterate grandmother use her phone with the help of doodles. Now 74, Encarna Alés left school at eight to work and never learnt to read or write. She loves phoning friends and family but couldn’t read the names next to the numbers in her address book. Pedro Ortega started, aged 11, to draw pictures next to them so she could remember which number was which. The illustrations have now gone viral on social media. “One day, my dad and I went round to my grandparents’ house to write down the numbers of friends for them,” Mr Ortega, a communications specialist, told the BBC. “But I realised this wouldn’t help my grandma as she wouldn’t understand the letters. “On every page and for every number, I would draw a picture that she felt would identify the person she wanted to call. How to tackle female illiteracy? His grandmother comes from Linares in the southern region of Andalusia. “She’s had a typical life for many working-class women of her era,” Mr Ortega said. “She was forced to leave school at the age of eight to go and work in a bakery to provide for her family, so she didn’t get an education. She used to be paid in food for her family, rather than money. Around 700,000 Spaniards can’t read and write, a 2016 report from the Institute of National Statistics said. Of those who are illiterate, 400,000 are older than 70.